When you encounter recent composers in the modern tradition, but more towards post-neo-romantic than serialist form, are they pre-postmodernists? There is a point where labels get ridiculous and that would be an example. Stephen Paulus has a musical style that is no throwback, yet his syntax is expanded tonality in the idiom of the 20th century more so than the ritualist quasi-naivete of the postmodernist crew. That comes through very nicely in a new disk of concertos and an orchestral work featuring impressive performances by the Nashville Symphony under Giancarlo Guerrero. Three Places of Enlightenment (Naxos 8.559740) carries the name of the subtitle for the "Concerto for String Quartet and Orchestra" that heads off the program. Sadly Stephen Paulus passed away several weeks ago in the aftermath of a stroke, so that his vital life statistics are now 1949-2014. By default this ends up being his first posthumous recording. The loss seems great as I listen to the music on this program. The music is prosaic, filled with eventful thematic richness and a sure sense of orchestral dynamics and color. The "Concerto for String Quartet and Orchestra (Three Places of Enlightenment)" (1995) is given its world premiere recording here. It has great drama and beautifully brio string writing for the quartet and the orchestral strings alike. The three movements have a very engaging forward momentum with virtuoso interplay within the quartet as well as with quartet and orchestra. Movement I "From Within" has a stirringly brisk pace that gallops across your speakers with diverse inventive passages that flow together with great rhythmic drive. Movement II "From Afar" has a chorale-like sadness expressed in the quartet and carried over to the orchestral strings, eventually expanding to the wider orchestra with expressive eloquence. It is touching, not sentimental as much as it is beautifully resigned. The final movement "From All Around and Radiating Ever Outward" returns to the briskly driving determination of the first movement. It is a work of genuine note, in every way a pleasing and extraordinarily well-turned showcase for the quartet with the orchestra taking an active involvement in the shaping of thematic development. "Veil of Tears for String Orchestra" (2005) is quite brief, an excerpt from the holocaust oratorio "To Be Certain of the Dawn." It is a somewhat sadly bitter largo movement, poignant but over quickly. 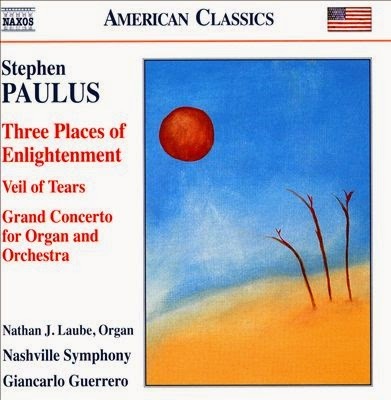 The three-movement "Grand Concerto for Organ and Orchestra" (2004) (in a world premier recording as well) features Nathan J. Laube in the soloist's role. It begins gradually, then launches into music with the kinetic drive of the string quartet concerto but of course with the color and power of the full organ on display. The organ is in a triumphic mode and the amassed sound of organ and orchestra make for some truly grand spark flying, thickly at times but luminously, too. The second movement, dubbed "Austere; Foreboding" has a stark darkness in keeping with such concerns. It quietly haunts as it shows the quieter side of Paulus's virtuoso brilliance in scoring. The movement lets loose with outbursts that overwhelm with a hugeness of sound and contrast with the quiet anxiety of the movement as a whole. The final movement ("Jubilant") gives us a rousingly kinetic triumph that literally pulls out all the stops and amasses a well phrased immensity that makes for a moving conclusion. 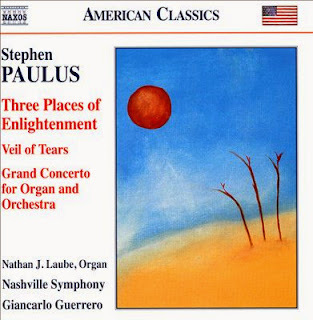 I am very glad to have this disk of the orchestral-concerted Paulus, which will give your stereo a real workout while it envelopes you in some beautifully crafted, rather brilliant music. The Nashville Symphony sound fabulous under Guerrero. RIP Stephen Paulus. Don't miss this beautiful farewell! The later symphonies of Shostakovich occupy a turf of their own. Each has a personality. That seems especially true of his Symphony No. 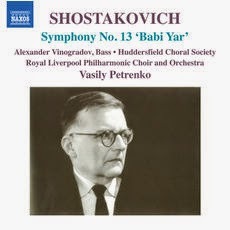 13 "Babi Yar" which has just been released in a Vasily Petrenko version with the male voices of the Huddersfield Choral Society, plus the Royal Liverpool Philharmonic Choir and Orchestra with vocalist Alexander Vinogradov as principal soloist (Naxos 8.573218). It was completed in 1962. Shostakovich was to go on to live and compose up until 1975, so it is not in any way his farewell work--he wrote two more symphonies and other works in the last years. And yet the 13th has a kind of finality to it, a dramatic quality that scales the heights of expressivity in some ways rather more so than previous works. It was written toward the end of Khrushchev's "thaw" and so perhaps there is a freedom of expression we are hearing. It also is based on a poetic text that severely takes Russia to task for its anti-Semitism, based on Yevtushenko's Babi Yar, which was published the year before. The influence of Mussorgsky can be heard; yet it is very much Shostakovich at his sardonic and almost brutal best. It is a dark work, fitting to the subject matter, brooding on the depravity of pograms, the hardness of women's lot in WWII, suppression, the persecution of Galileo and the absurd policies of bureaucrats, each movement a setting of another Yevtushenko poem, each filled with reproach, the only redemption offered by a bittersweet, unforgettable motive in the flutes towards the end. Bass vocalist Alexander Vinogradov gives us a gravitas performance of the best sort, amplified by the all-male amassed choirs. The Royal Liverpool Orchestra brings forth a vivid and rousing performance. Vasily Petrenko's interpretation is without flaw, impassioned. There are many recordings of this symphony, some no longer available, but the Petrenko rivals them. With the Naxos price I recommend this version without hesitation. It is vital Shostakovich in a vital performance. Though Ernst Bacon (1898-1990) composed fairly prolifically for the solo guitar and other instrumental configurations, he was mostly known in past years as an exponent of art song. Only one solo guitar work was published during his lifetime. Yet 19 pieces survive, laying in manuscript after being composed between the 1960s through the 1980s. He wrote them in the main for his son Joseph to play. They have a kind of intimacy to them that perhaps reflects the family setting. 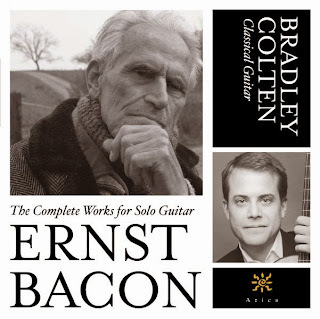 In any event guitarist Bradley Colten gives us a recording of The Complete Works for Solo Guitar (Azica 71294). I've been listening and duly report in as always. Bacon was a contemporary of American pioneers like Copland and Harris, though he never quite received their recognition. The works presented here by Colten have sometimes a rustic charm befitting of Americana. Other works are more straightforwardly abstract, more or less neo-classicist (for example "The Three Canons"). Through it all there is a good feel for the multipart and sometimes contrapuntal capabilities of the classical guitar. The music is modern in its chromaticism and at times quite "folky." Bradley Colten gives us well worked-out versions of the music and the sound is good. It's the sort of album that takes a bit of getting into but the rewards are there awaiting the patient listener. It is a refreshing bit of plain air music, neither pretentious nor unschooled. It suits many moods in its matter-of-fact expression. 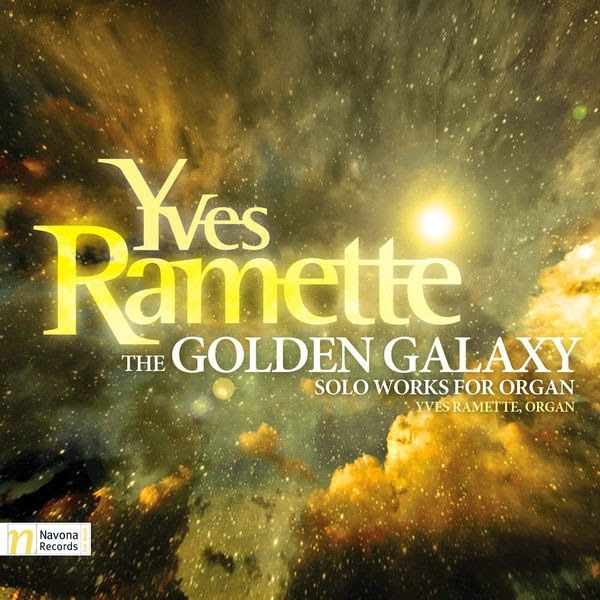 If you respond to the world of Messiaen organ music there is Yves Ramette (1921-2012), a French composer finally getting his due. He does in his own way what Messiaen did so well, to utilize the organ in modern chromatic, symphonic ways. The Golden Galaxy (Navona 5971) gives you a full CD and another EP CD (with enhancements) that cover his works quite nicely, as recorded by the composer between 1965 and 1993. The set contains works of real drama and impact. There is virtuoso excitement generated by these works in Ramette's hands and you don't notice a difference in sound quality between the early and later recordings. What stands out is the extraordinary orchestral sonics of these works, their boldness, their vivid contrasts, their thematic singularity. Ramette was a student of Honegger and went on to teach and compose over his long life. The music here has true originality. Based on the recording one would not hesitate to place him among the great organ composing exponents of last century. For those seeking holiday fare there is the adventurous "For A Christmas Night," but this set is one for all seasons. When someone has established a style of indubitable originality, it seems less critical to try and define the style category he or she works in. It involves a category of one. Still, one can see variously in the mature music of Arvo Pärt a looking backward at times, as a new music exponent of early music, a practitioner of "radical tonality," a minimalist, or perhaps at times a later follower of Erik Satie. The idea that you could fit him in a number of camps in part has to do with his originality. Beginning in the '70s he followed his own muse. Categories are applicable after the fact but do not explain away his music in any concrete sense. 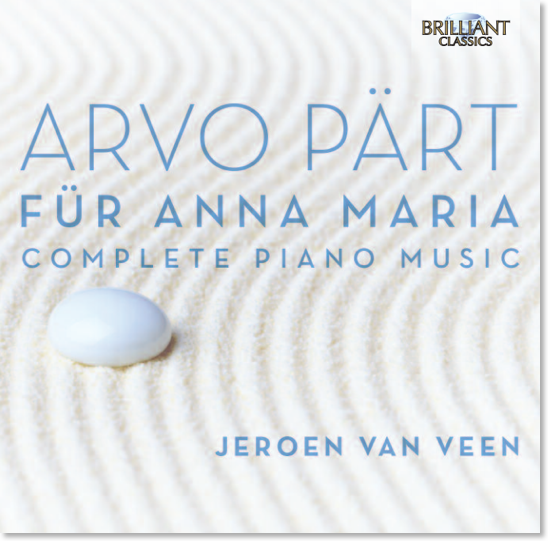 So when we turn to a two-CD set just out, Jeroen van Veen playing Fur Anna Maria, Complete Piano Music (Brilliant 95053) we hear the composer as Arvo Pärt, not as a set of labels. The set covers his contemporary style period for the entire first disk and about half of the second. The second also gives you four earlier works from 1956-1959. The latter are brilliant in their own way, in a more conventional modern style that adds to our appreciation of the composer in his totality. They are pianistic and memorable. But the later Pärt is what the bulk of this set covers. Jeroen van Veen (who we have covered earlier this autumn [September 17th] doing the music of Jacob TV) has the right personality for the music and delivers performances in every way worthy. Ralph van Raat did a disk of Pärt for Naxos some years ago (see October 20, 2011 posting) which has some overlap but then includes music for piano and orchestra. It is excellent as well. Both are different enough that one should probably have both. Van Veen gives us two short and two long readings of "Fur Alina," which like some Satie works calls for repetition of a fairly short compositional sequence. We also get a bonus with the inclusion of "Fratres" and "Spiegel im Spiegel," which includes Douw Fonda's cello. Two pieces are for two pianos; Sandra van Veen joins Jeroen on these and sounds good. The piano music universe of Pärt does not have much in the early-music influenced category. That's more what the vocal music covers. What his piano music is about in the mature period is singing diatonics, lyrical, reflective music that has some relation to Satie yet inimitably shows the very original melodic stamp of Arvo--deceptively simple yet unexpected in syntax so that it gives the listener much to ponder and never grows tiresome. This is a central disk. 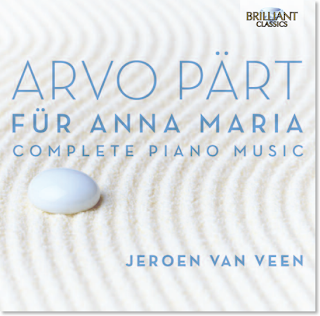 Taken along with the van Raat Naxos it covers the pianistic totality of the composer and does so with all the sensitivity and deliberateness that is essential to bring his special world alive. "There is no rose of such virtue..." so the old Christmas carol goes. But roses, in our contemporary world anyway, are destined, like us all, to cease to be some day. And sad to say, the same thing is true of musical congregations. 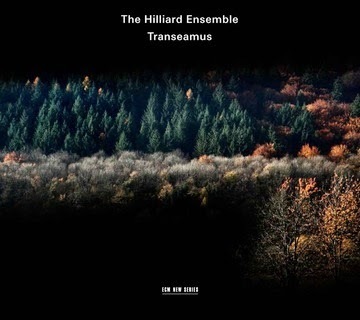 Transeamus: English Carols and Motets (ECM New Series 2408481 1106) will be the last album of the Hilliard Ensemble on ECM. They are retiring. They have graced our ears with early vocal music for decades and done some wonderful work in the contemporary vein, too. They have been a superb exponent of vocal color and nuance, one of the guiding lights of early music performance practices today. So we have one last album, of 15th century two- and three-part polyphony for Christmastide and on other related sacred subjects. For us they have been a blossoming, a rose if you will, and the season of the full flowering is passing, at least as an ensemble. We take solace in this beautiful album. Certain music has the power to bring back a past long-gone. To me that certainly is true of early music for Christmas (and for that matter, a great Jewish Cantor performing music of an earlier age). It connects us with a past that humanity lived through. We feel a commonality with them, for we live, too. The program is a good one, with music both familiar and less so, "There is No Rose" along with "Clangat Tuba" both by an anonymous composer. There are others by unknown hands, plus those by John Plummer, Walter Lambe, William Cornysh and Sheryngham. Throughout it all there is the Hilliard Ensemble, a small vocal group who realizes polyphonic vocal music with a sweetness and light that make them inimitable. They sound great as usual on Transeamus, which aptly translates as "we travel on". And so we do, all of us, headed from here to where we will. A singular album this is, in the simple small ensemble format but with a richness of timbre and recorded sound that stays in your ears long after the music has ended. May it never end. Something that won the Pulitzer Prize for music in 2014 you tend to handle with kid gloves. But then you must listen anyway and forget all about that. 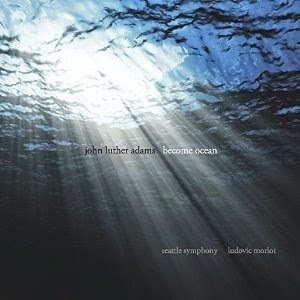 Such is the case with John Luther Adams' major orchestral work Beyond Ocean (Cantaloupe Music 21101 CD and DVD). The Seattle Symphony under Ludovic Morlot have the performance for us here, and they give us a very atmospheric reading that seems just right. It is a sprawling work, a long, sustained representation of the primordial ocean. The ebb and flow of the music is like a series of waves in ultra slow motion. Very long, tonally chordal note combinations cluster and flow in the music. There is a central, slowly ascending motive in the strings that reappears from time to time. It is music that is ever-changing from within, yet somehow ever the same. There are arpeggiated figures on the piano, mallets, harp and other instruments that merge with the long tones and do not as a result stand out as minimalist in design. This is more akin to the sort of Radical Tonality that we have heard in many examples on Cold Blue records (do a search for those) only this is for a seemingly large orchestra and goes on for quite some time. It is mystical, haunting, filled with epic sea-as-cosmos audio that will put you in a very different place. The CD has great sound; the DVD gives you the 5:1 surround option and gently fades a series of beautiful sky-ocean images that repeat throughout the performance. Description in words only takes you so far with this music. It really must be heard. It along with Markus Reuter's orchestral work (see review from last June) gives you a new spiritual opening if you will, an orchestral soundscaping that takes you away from rhythm and brings you instead to an endless canvas of solid and transparent color fields, a long unbending road through sheer and ravishing sound blocks. 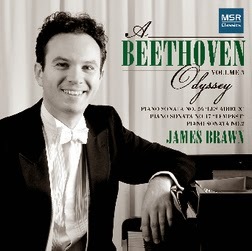 Pianist James Brawn is embarking on A Beethoven Odyssey. Volume 3 (MSR 1467) currently plays on my computer as I write these lines. It contains Beethoven Sonatas No. 26 "Les Adieux", No. 17 "The Tempest", and No. 2. Maestro Brawn dedicates himself to the performances as Beethoven intended, with all the repeat signs honored. That's a good idea. With the CD world we can certainly make the space, and in the process we hear each sonata as an entity of substance. With such ambitions realized near the halfway point, the total set will likely fill nine volumes, so the liners say. Volume 3 gives us an idea of James Brawn's acute sensitivity to the Beethoven. With the current volume we get something from the classical period (No. 2, 1795), edging into the mature period (No. 17, 1801-02) and then rather firmly into the blooming of the romantic (No. 26, 1809-10). With all the repeats the No. 2 runs around 30 minutes. That provides us with a much deeper experience than otherwise. It gives the early work an imposing grandeur than it does not always possess in recorded form. Of course it is the interpretative talents of James Brawn that either make something out of the complete opportunity or elsewise. Certainly on this volume we hear a real artist at work. The performances are filled with passion but also a classical sense of proportion. Of technique there is an abundance but it never comes to the forefront as display. Brawn harnesses his pianistic abilities to the objective of realizing the Beethoven compositional world in its fullest, most poetic, yet also in its direct, matter-of-fact sense. Others may take some passages faster, or, for that matter slower. Brawn gives us interpretations of elegance more than pure fire. And in the process gives us a Beethoven that calls attention to the most Beethovenesque note rendering, not as much a willful brilliance that calls attention to itself. In the end I find James Brawn a deeply appropriate medium to realize Beethoven as he might himself have most appreciated. It is pure music, and of course has a brilliance that doesn't always need virtuoso, self-indulging enhancements. If further volumes are true to form, and I see no reason to doubt that, this will be a cornerstone edition of the complete sonatas. One with a constancy of faithfulness to the composer of wonderful piano music. It can stand alongside more flamboyant versions as a kind of benchmark, weather vane, a cornerstone, a standard by which others might be measured. Have a listen and see if you don't agree. James Brawn is Beethoven on this disk. He is the channeling of the Beethoven ethos, personified if you will. Bravo. 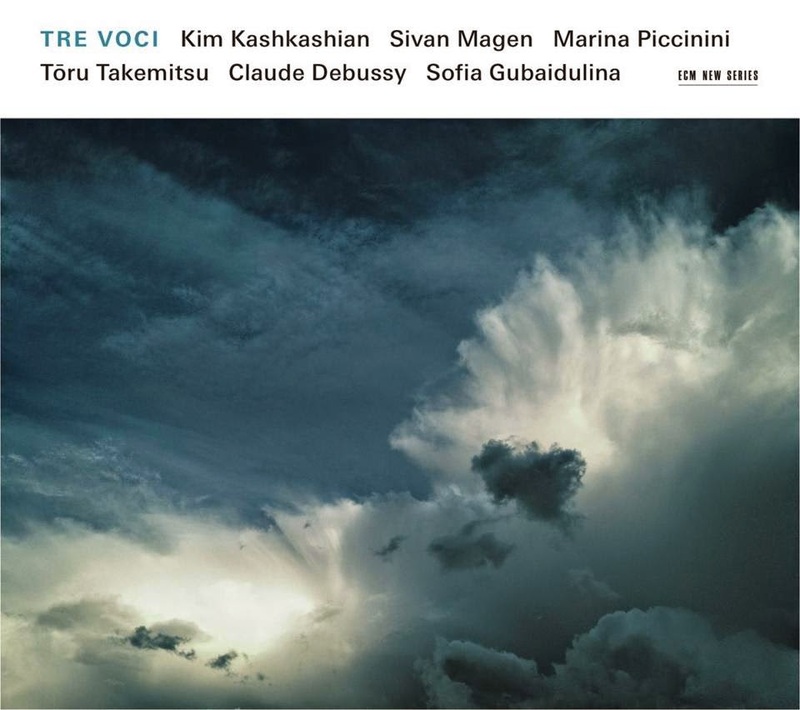 Premier violist Kim Kashkashian has gathered around her two very worthy partners in Sivan Magen on harp and Marina Piccinini on flute for a fine outfit they call Tre Voci. It is also the title of their debut album (ECM New Series 2345 4810880) which is simply self-titled. For it they have chosen three works that go together quite well. The lyrical, pastoral mode so fitting for this trio instrumentation is realized nicely by choice and execution. The centerpiece is the well-known, well-appreciated Debussy "Sonata for Flute, Viola and Harp". It is surrounded by later, somewhat lesser-known works that have a slightly more modern bent but pay equal attention to the special sonance of the trio of instruments that make up Tre Voce: Toru Takemitsu's "And Then I knew 'twas Wind" and Sophia Gubaidulina's "Garten von Freuden und Traurigkeiten". The two later works have an affinity with the Debussy trio, the latter of which the composer wrote at the end of his life and managed to embody, as the lucid liner notes to the album point out, a kind of affinity with an Asian concept of time, of a simultaneous unfolding of sound within silence if you like. It is surely one of Debussy's masterpieces, almost uncanny in its ethereal qualities. It points to the future in ways that both Takemitsu's and Gubaidulina's works further realize. The Takemitsu trio equals the lyric qualities, the Gubaidulina assigns specific roles to each instrument to produce lyrical but perhaps slightly more mysterious assemblages of sonic brilliance. Tre Voci come through with ravishing renditions of all three works. I have never heard a more evocative Debussy. They give us a poignancy that the ECM audio production reinforces with singular appositeness. The other trios complete the mood with more of the gently spectacular introspection the pieces call for and are certainly given. Tre Voci give us an almost indescribably beautiful triumvirate of performances on this recording. They set the bar high and program thoughtfully so that this seems like a definitive recording. It is gorgeous! Handel stands or falls in the performance. That's true of baroque masters in general as it is true of any period's greats. Handel's operas and oratorios are not only no exception, there have been (especially before the original instruments movement) a fair number of lackluster performances available. When he is played and interpreted well, there is magic. 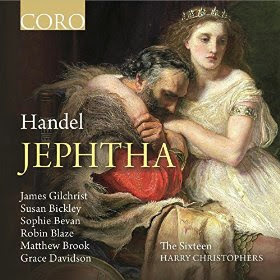 Luckily for us we have a near perfect gathering of singers, instrumentalists and interpretive acumen in the new new Sixteen/Harry Christophers recording of Handel's last oratorio Jephtha (CORO 16121 3-CDs). 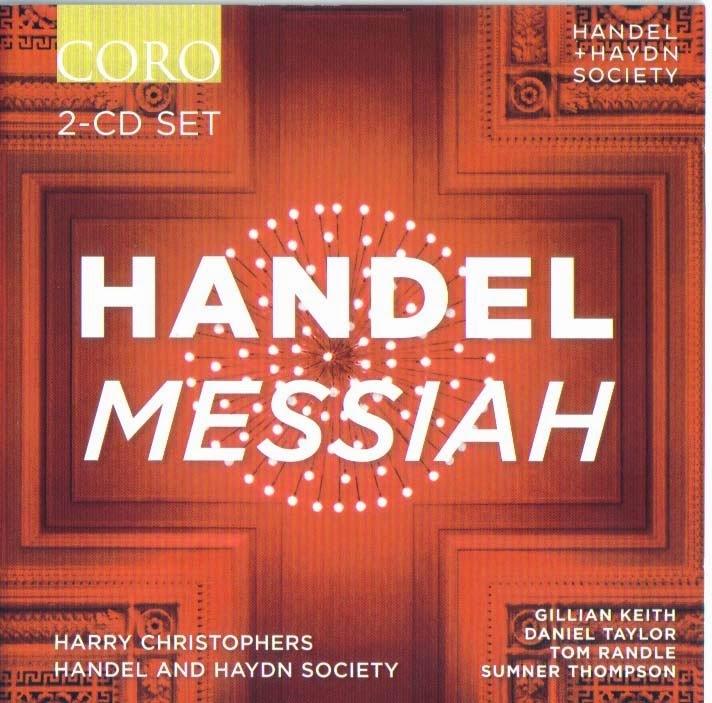 Since we discussed Christophers and the Handel and Haydn Society version of Handel's Messiah Friday, today's post follows logically. It is a remarkable work, even for Handel. There is great drama, excellent arias, good choruses and the memorable tunefulness that characterizes Handel at his best. Destiny marks the overall theme. The vocal soloists do an exceptional job: James Gilchrist, Susan Bickley, Sophie Bevan, Robin Blaze, Matthew Brook and Grace Davidson, all. The choral passages (with a relatively small group per the accepted practices of the era) are presented with spirit, the small, period-instruments orchestra glows with all the warmth and sweetness a good period ensemble can give. The tempos do not drag. Time passes quickly as they draw us in. We respond with pleasure. The drama comes through without pretension, straightforwardly. And the libretto is in English, which makes the work all the more accessible for my English speaking readers. The recording gives cogent proof, if we didn't already know, that as great as the Sixteen and Christophers are for Palestrina (see previous posts), they are just as accomplished in putting together a ravishing interpretation of a Handel Oratorio. Of all the baroque sacred choral works, oratorios with orchestral accompaniment anyway, and there are very many, Handel's Messiah triumphs as the shining jewel of the art, a near-perfect work. Only Bach's St. Matthew's Passion offers a true rival presence. My high school choir and orchestra ambitiously performed Messiah selections when I was just a freshman and hearing them rehearse it over the fall months, then the December performance, was an ear-changing experience. I little-by-little fell completely under its spell, through a complete recording and hearing the Masterwork Chorus perform it yearly in New York. There have been performance practice changes over the years. For a time Mozart's reorchestration for larger orchestra held sway as did ever larger choruses, numbering well over 100 voices in many cases. There is also a Beecham orchestration for a full-blown ensemble of romantic proportions. There are still those who perform the altered versions and I see nothing to complain of there. It can be devastatingly moving. On the other hand there is a growing trend away from all that to the original version with original instruments and orchestration, with a chorus of 30 or so and soloists. Enter Boston's Handel and Haydn Society, who are celebrating their bicentennial in 2015. They gave the first US performance of Handel's Messiah in 1818, consequently performing it annually from 1854 to the present day! Harry Christophers and the Society give us this season a brand new performance with the original version, complete with all the performing conventions and practices as Handel and his era assumed, in the smaller orchestration and a choir of thirty or so. Soloists include a countertenor in place of the usual mezzo-soprano, which gives us another perspective as well. All this can be heard and appreciated on a 2-CD set just out (CORO 16125). The more compact forces lead to a more intimate impression. The chorus excels in the brisk pace Christophers gives many of the movements. The singers dive into the melismatic (multiple notes for a single syllable) passages with vigor and they project wonderfully. The soloists are up to the music in every way, though I have been spoiled by a recording that features the great Peter Lewis as tenor. But that recording is a romantic-sized rendition with a very different charm. The soloists here do a fine job anyway, though they may fall just a tad shy of the very greatest historically. One cannot expect everything in a single performance so it is not an issue. The celebratory new Handel and Haydn Society version achieves the glory and power of the work with the lesser forces. I have not heard a more moving "Hallelujah" chorus. Their "Amen" is a thing to give you the chills. In fact the entire second part of the work glows with energy and conviction, not to say that the first part is lacking. It is a Messiah that builds to a wonderful climax. If you don't have a period version, this one would make a fine addition to your library. If you don't know the Messiah this is a good place to start! It is in every way a commanding performance! Happy 200th birthday to the Handel and Haydn Society. I think I've said this before, but today's album drives the point home ever more strongly. That is, that hearing romantic era piano music on a modern concert grand gives you an entirely different impression of the sonic balance than if you hear it on a period era piano. The modern piano emphasizes all ranges and registers with a more-or-less equal presence. The period piano has less intensity and sustain power, and more of a fragility to the sound. Each range has markedly different sound qualities across the board. (Different, that is, than how each range sounds on a modern piano.) Certain forte passages played on a modern piano are brazenly full, evenly balanced. The same played on a period piano gives more articulation between figure and ground, if played as they were originally intended by a fine pianist. Andreas Staier is the right pianist for a project of this sort, very much so. His third volume of Robert Schumann piano, covering the Variationen & Fantasiestücke (Harmonia Mundi 902171), will make a believer of you. The music is not so well-known that we have been overexposed and settled in to the modern pianoforte bombast of a typical bravura reading. Yet there is much beautiful music to hear. I have never heard this music played in a way that doesn't eventually weary me, to tell the truth, though I do love Schumann and his piano ouevre very much. 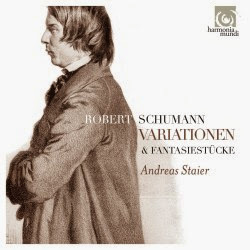 But no, these Staier versions let you discover the delights of savoring the inner voices, which are considerably well-wrought, without them dominating and clouding over the thematic thrust of the pieces as Schumann conceived them. Of course it isn't all in the piano, it is also in the brilliance of how Andreas articulates and phrases each passage. If you have ever found romantic piano music overly dense, a little too ever-present, Staier may well open your ears to what the music was meant to sound like. As much as Rachmaninov is dear to my heart, the music from the romantic era need not always have that slapdash van Cliburnian overexpression typical of late romantic Rachmaninov and typical mid-20th century performance practice. Earlier romanticism is not all supposed to sound like Rachmaninov, of course. And the power of the music can be as much or more in the subtlety of interpretation as in the amount of projective power. And so I come away from this disk a happy camper. Schumann never sounded so personal, so little a projection of future hearing on an earlier period. It is of course a testament to Staier and his poetic artistry. . . and the right piano. The development of woodwind virtuosi is nothing especially new. Of course in the realm of jazz there are have been many and continue to be. Modern classical has its share as well. Today's players tend to have mastered both conventional and less-conventional techniques of sound production, including complex-toned harmonics, alternate fingerings and falsetto range development. Clarinetist-bass clarinetist Pat O'Keefe most certainly fits in with these trends as an excellent instrumentalist with a sure sense of purpose. He tackles six contemporary modern works for the two clarinets on *Contents May Differ (Innova 888). Most all the works embody the new music extension and alteration of woodwind sound production. That they do so in different ways enables us to sample a broad spectrum of possibilities. Jeff Lambert's "Dissonant Grooves" and Ann Millikan's "Dendrite" explore the possibilities for solo Bb clarinet and bass clarinet, respectively. Scott Miller gives us his "Contents May Differ", a dramatic exposition for bass clarinet and amplified, electronically transformed bass clarinet sounds. (Miller has several albums out of his own that I've reviewed on these pages. 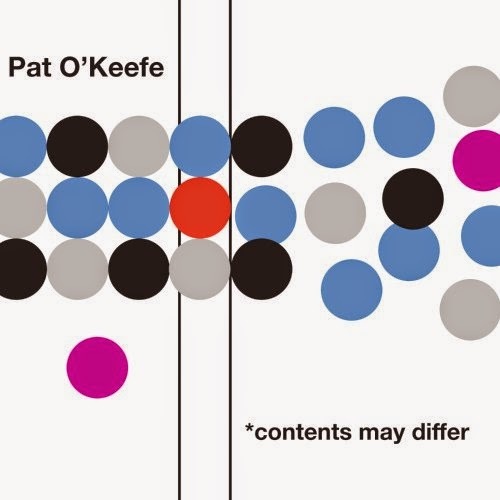 One features Pat O'Keefe. Type his name in the search box above for those.) It is expressive, dynamic and almost orchestral towards the end. Brett Wartchow's "Unbound" takes Shelley's poem "Prometheus Unbound" and constructs a very lively solo clarinet piece around it. The music exemplifies a kind of analog to the poem's unbinding, and does so in interesting ways. O'Keefe's own "Silent Snow" introduces Paul Cantrell on piano for a duet work that begins softly with quiet melodic figures that touch on harmonic overtones, the piano entering with equally quiet accompaniment that evokes the hush a newly covering blanket of winter snow can uncannily produce, especially in the evening when nature and humanity seem in suspension. The concluding portion of the piece becomes more emphatic and strident, appealingly so. As quiet as the snow falling may be, perhaps the music is saying, its accumulated effects can be more than a sort of fairyland. We who endured last winter in some areas know that all too well. Nonetheless it is a magical moment in real life that transforms well the overall compositional, airy lightness of the work, becoming in the end something a good deal more heavy in what it leaves behind for us. The final work is in four parts, a bass clarinet-piano duet by Paul Cantrell entitled "The Broken Mirror of Memory". This is full-blown modernist expressionist poetics, a fitting end to the program and a bit of a tour de force. The chorale-like passage at the conclusion of the work gives us closure, a kind of "amen" to the entire program. Pat O'Keefe provides us with a great deal to appreciate in *Contents May Differ. It shows his considerable artistry as it also gives us vibrant modern music. All who follow the contemporary new music scene should readily respond to this one. It is an exemplary program that shows virtuoso sensitivity and some excellent compositional work as well. Recommended. The rise of live electronics with instrumentalists in the new music world is very much with us today. This can be confirmed by the many releases devoted to such performance practices. A very good example is today's 3-CD set, Triple Point and their Phase/Transitions (Pogus 21078-2), recorded in New York State between 2008-2012. The essential lineup is that of Pauline Oliveros, on V-Accordion, an electronically enhanced version of the instrument that produces what the liners call "physically-modelled acoustics", Doug Van Nort on the Granular-feedback Expanded Instrumentation System (GREIS) and electronics, and Jonas Braasch on soprano sax. The music consists of a number of shorter segments of improvisation. Van Nort uses GREIS to take the original instrument signal feed and transform it, making a commentary on what is being played or transforming the musical input into entirely different terms (e.g., adding to the soundscape). For a number of segments the machine improvisation system known as FILTER performs in tandem with the trio. Some other segments feature Chris Chafe on celletto, performing remotely over the internet from Canada. The three CDs cover a wide range of moods and sounds, all in the more-or-less "new music" zone, which is to say that timbre manipulation and contrasts play out in real time in an improvisatory context. Braasch's soprano is nearly always to be heard in its pure acoustic state along with its transformation by Van Nort. Ms. Oliveros' accordion sometimes can be heard clearly in its pristine form. Much of the time the sounds are electronically altered in varying degrees so that it sometimes sounds much more like keyed electronics. The electronics of Van Nort can be heard at times as a third instrumental element. At other times they mesh with Ms. Oliveros' sound transformations to create a kind of electronic-orchestral commingling. What captivates in most of these trio improvisations in the sheer inventiveness of the sonic designs. Some segments flow with long-toned sounds played out against more eventful noted-ness from the soprano, accordion, electronics, or all in various combinations. Other segments are more-or-less pure give-and-take contrapuntal interactions. Three CDs of such music is a great deal to absorb. It takes time and "deep listening" to completely assimilate. I can't say I am quite there yet. But I can say that this music has moments that stun in the best way. There are mellow segments and others somewhat abrasive. But they do not repeat themselves. Avant jazz, new music and electronic music converge on Triple Point. And the three artists in the process become one creative music-making being. It no doubt is music of some importance for the avant scene today. It carries on the premises of the seminal live electronics-acoustics outfits from the first days of such possibilities and makes something wholly unique and fascinating out of it all. Sonic adventurers will most definitely gravitate towards this set. Recommended for all those who dare go beyond the ordinary. An album that is a bit of a sleeper gets to you by degrees, often enough. That's what happened in my listening to an album of recorder and guitar duets from Denmark, Duo Oldrup/Lauridsen and their Eyktime (Gateway 001). It is a seemingly straightforward proposition of the pairing of Christina Lauridsen on all manner of recorders and Peter Oldrup on classical guitar. The program is a contemporary one, covering five composers and five works. Each has a special character. Most all of the music is tonal, though sometimes expansively so. All have a playful and ear-worthy quality. The artistry of the duo shines through during the whole of the program. They have obviously worked out the performances with care and their sympathy with the music and individual talent combine to make for lively listening. Most of the composers may not be well known to you if you are reading this in the States. Ole Buck gives us his "Petite Suite", Christos Farmakis something called simply "g", Vagn Holmboe his "Canto e Danze", Frode Barth contributes "The Cure", and Hermann Rechberger the title work "Eyktime". The recorder generally plays the sprightly role, the guitar generally functions as the classical harmonic-melodic completest, doing more than mere accompanying. This is not exactly "light" classical; it is too involved and intricate to be in that category. Yet it is lighthearted music on the whole. Duo Oldrup/Lauridsen are to be congratulated for this fine effort. The music comes through convincingly in their hands. It is a sheer delight to hear. The number of composer active today is virtually as countless as the stars in the firmament, as is the number of releases devoted to them. It is impossible to keep up with the statistical density of what's being produced. All one can do is listen and report in on the ones that impress as worthy whenever one can. Such a composer is Walter Ross (b. 1936) who studied under Robert Beadell, Robert Palmer and Karel Husa. He is active as a double bassist (in the Blue Ridge Chamber Orchestra) in addition to his composing. The present volume serves as a good introduction to his music, covering his "Concerto for Double Bass and Orchestra", his "Piano Concerto 'Mosaics'", and his "Clarinet Concerto". Triumvirate (Ravello 7893) is the title, not inappropriately. Ross gives us a modernist tonality in a style that fits in with some of the American composers of the 20th century, expressively neo-romantic at times, classically formed, with a slight rusticity that hearkens back ever so subtly to an Americana of yesterday while at the same time having a booster-ish progressivity. That does not quite describe the impact of the music, but it does comes close. There is a lyrical side that can especially be heard to good advantage on the "Piano Concerto", a rhythmic vitality apparent throughout, and thematic inventiveness. The "Double Bass Concerto" is one of a very few out there, so it is especially welcome. There are soaring arco lines that make the bass sound as if it were a deep-ranged sibling of the cello, which of course makes sense. The music has a stately, measured quality in keeping with the regal personality of the solo part. The "Piano Concerto" seems especially strong and original, with a good deal of forward moving energy and momentum, a busy thematic unwinding shared and dialogued between piano and orchestra. The momentum continues in the "Clarinet Concerto", with some wonderful clarinet passages and a rustic dance quality in the first movement, a tender lyricism in the second and a stirring liveliness in the finale that once again suggests a country dance. The orchestral duties are divided between the St. Petersberg State Symphony Orchestra, the Slovak Radio Symphony Orchestra and the Warsaw National Philharmonic, all of whom give us quite respectable, lively readings. Kudos to the soloists are in order: Artim Chirkov on double bass, Marjorie Mitchell, piano, and the great Richard Stoltzman on clarinet. All-in-all this is a fine recording. It will appeal especially to those who follow the American compositional modernist scene, who are open to a lesser-known yet worthy figure. It transcends those boundaries too, so that the music speaks across borders to anyone open to a middle-road modernism. 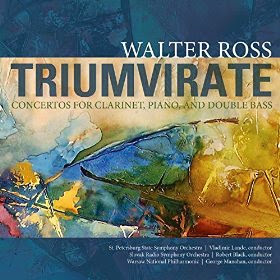 Time today for another from the "radical tonality" modern composer group. Steve Peters comes front and center for an EP of "Three Short Stories" and "My Burning Skin to Sleep", on From Shelter (Cold Blue 0018). The works play themselves out in slow, folkish diatonic asymmetry. "Three Short Stories" centers around multiple violas played by Alicia Ultan for a haunting, nearly vibratoless counterpoint of intervallic cells that are ever-changing yet have a cantabile, rural song-like unfolding. It is almost like folk fiddling, yet very slow and without an ABA structure. "My Burning Skin to Sleep" turns to multiple vocals by Marghreta Cordero and the piano of the composer. They continue in the slow deliberate manner of the "Stories", only now we have a repeating chord progression that underpins wordless vocals in a slow counter-interaction of their own. The work goes well with the "Short Stories", almost a continuation of the work by other means and intervallic relations. The delicate chordal ostinato of the piano contrasts against the endless melodic-diatonic, purposeful wanderings of the voices. Plaintive? Just a touch. I won't say that this is one of the very best of the Cold Blue EPs. Yet it is very attractive, beautifully sedate. The long winding trail of diatonic variations makes this music far from banal. The performances make the music flow like a pond with a slow undulating motion in the waters. . . a light wind on a fall afternoon, perhaps, making the movement possible. It is well thought-out fare. Delightful. Meditative. Like the very best of musics, Beethoven's Complete Works for Violincello and Piano put roots down in my musical being (in this case during my late youth-early adulthood) and has given rise to a magnificent garden of earthly delights, which continues to grow more luxurious and beautiful with every passing year. The Sonatas op. 102 are perfect examples of Beethoven's late work, deeply complicated yet filled with a freshness that never leaves them. The earlier works give you his more compact classicism, wonderfully. In a complete works edition you get the sonatas and also the variations, all of which make for a vivid evening of music. Like perhaps many I started with the Pablo Casals versions, added on the Rostropovich, and now have appreciated some of the more modern recordings. Today's seems close to ideal. 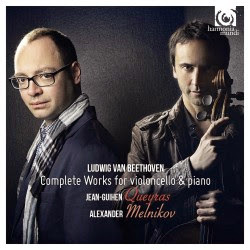 Jean-Guihen Queyras and Alexander Melnikov teamed with Isabelle Faust to give us an exemplary recording of Beethoven's Piano Trios (see the February 17, 2014 post on this blog) and now quite logically and satisfyingly the two return for the cello-piano sonatas (Harmonia Mundi 902183.84). Queyras is a jewel in the Harmonia Mundi pantheon, with a beautiful personal tone and impeccable musicality. Melnikov is a formidable and completely compatible partner, with phrasing and a liquidity of tone that puts him in the highest ranks for this kind of music. Put the two together with this music and you have real excitement, passion and some very impressive brio. They take some passages at a maddening clip and make the music swell in all its glory. They linger on other passages with passion but no sentimentality whatsoever. All around this may be the most balanced reading we are likely to get. It doesn't over-emote nor is it in any way a clinical interpretation. Of all the modern recordings this one for me satisfies the most. Of course I appreciate the other versions I have for the differences in approach. But if you could only choose one, this one is highly recommended. Needless to say it will fit right in with your collection even if you already have one or more other recordings. Queyras and Melnikov are masters. They show their extraordinary teamwork on this release to great affect. Bravo! The viola has special charms that the violin does not. No, it doesn't have the piercing brilliance, not all of it, that we expect of the violin. What it does have is a dark richness, a woody quality that can lend itself well to introspection and dramatic expressiveness. Contemporary composer Mark Winges seems to recognize wonderfully the distinctive personality of the instrument in a full disk of chamber music featuring the viola, titled fittingly Night Voiced (Ravello 7880). Ellen Ruth Rose is the soloist in all but one of the four works represented and she comes through with great poise and feeling. All the works are comparatively recent, written between 2004-2011. They vary in instrumentation. 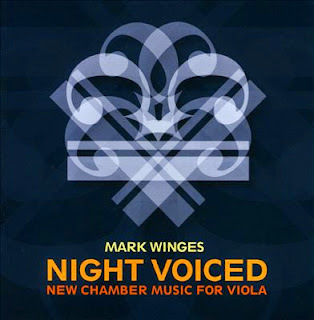 "Night Voiced" (2011) combines viola with organ, "Reciprocal Tapestries" (2004) with cello and piano, "Diverted Vignettes" (2012) is for solo viola, "San Francisco Stopover" (2006) joins viola, cello and guitar, and the reprised version of "Night Voiced" replaces the organ with the piano. Throughout we hear a thoughtful composer set on exploring sound colors and a wider modernist tonality to show off the viola in moods that range from gravitas and intimate reflections (the solo Vignettes) to more extroverted stateliness and expansiveness. Paul Hindemith was a viola player of excellence and wrote many works showing the viola as much more than a lower ranged cousin of the violin. Perhaps not surprisingly Mark Winges' music here shows an affinity with Hindemith's in its logically unwinding quasi-neo-classical regularity through much of the program ("San Francisco Stopover" being something of an exception in the all-over quality of its opening movements). The music has genuine substance. Each work has structure and mood. Each stands on its own. Ms. Rose sounds quite right for this music, turning in performances that are compelling and expressive. In all this is an excellent representation of Winges the dramatic and inventive exponent of modern chamber music. Those who love the viola will be captivated. And those who don't will likely be pulled into the orbit of this program regardless. Very recommended. In the mid-20th century a composer who was determined to work within the parameters of an earlier style was not always given the attention his or her music deserved. 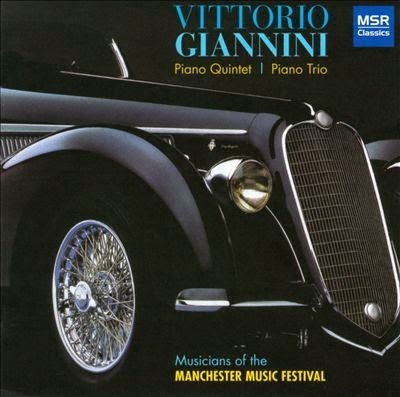 Such was the case with Vittorio Giannini (1903-1966), whose neo-romantic approach may not have endeared him to the mainstream modern music circles, but whose music was generally memorable and finely crafted. Nonetheless he made his mark as a teacher of composition at Julliard, Curtis, etc. In my early years a Mercury recording of his "Symphony No. 3" by the Eastman Wind Ensemble coupled with Hovhaness' Fourth was readily available and served as my introduction to the composer. It remains well worth hearing if you can find it. Now we have a very nicely performed volume of his chamber music, namely his Piano Quintet and Piano Trio (MSR Classics 1394) by Musicians of the Manchester Music Festival. The two works are unapologetically romantic. Yet thematically and in terms of structure they are excellently wrought. It's music that sounds more like Brahms than Berio, of course, but if you disregard your expectations you hear some very fine music in full romantic flush. I am glad to have it. The McCormick Percussion Group match prolific activity with adventurous programming (type in the search box for previous posts). 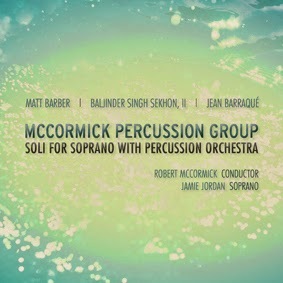 Their latest, Soli for Soprano with Percussion Orchestra (Ravello 7884) is no exception. There are three modern works represented, Jamie Jordon does a fine job in the soprano role, and Robert McCormick conducts. The composers are a mix of newer, lesser-known figures and a more established historic one. Matt Barber comes through with "To the Roaring Wind", Baljinder Singh Sekhon II "Twelve Virtues" and Jean Barraque with "Chant Apres Chant". All three works have the percussive dynamism one might expect, soprano parts both declamatory and lyrical and an appealing variety in the forward-looking modernist vein. Sekhon's work takes thorough advantage of pitched percussion for a harmonic exoticism along with rhythmic motility. The soprano part is alternately whimsical and dramatic. Barraque has the older, high-modernist flair with piano and bombastic percussion contrasts of tumbling irregularity with quieter spaces, musical color and a more through melodic quality in the soprano. Matt Barber gives us nine short movements with much orchestral-timbral contrasts and a soprano role that has a great deal of grit and substance to it. There is nothing lacking here. The McCormick ensemble show once again a flexible discipline coupled with excellent attention to phrasing and structure. Jamie Jordan excels in her various roles with a pleasing ability to change her sound according to the demands of the music at any point. Surely those with a love of modern vocal music, percussion and new sounds will find in this one much to like. The idea of a percussion orchestra capable of a wide variety of sectional and intermingled textures gets an ideal realization in the three works and their masterful execution. Through serendipity I've never heard Poulenc's Sabat Mater until now. Harmonia Mundi was kind to send me a copy of the version featuring Carolyn Sampson in the soprano role along with the Estonian Chamber Choir and National Symphony Orchestra under Daniel Reuss. I am surely glad they did. Poulenc wrote the work in 1950 following the death of Christian Bernard, who among other things designed sets for Cocteau. The composer describes it as a "requiem without despair", and indeed, it is more beautiful and consoling than mournful. It is a striking work with the choir taking pride of place. You can imagine the composer doing his composing on a piano, in part because it is much more homophonic than polyphonic. You can imagine him trying out various voicing possibilities until he was satisfied. The results are in the choral tradition but a good deal more post-romantic/modern than neo-baroque or neo-classical. And why not? It is a work that stands on its own as a singularly moving elegy, with harmonic movement that is nothing short of extraordinary. Sampson and the amassed choir and orchestra under Reuss give us a tender and dramatic reading of the work. 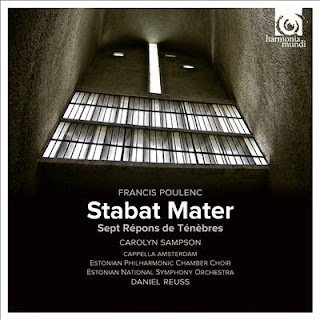 It's a side of Poulenc I've missed and I am glad to have caught up to it at last. The version offered here is sonically stunning and state-of-the-art. 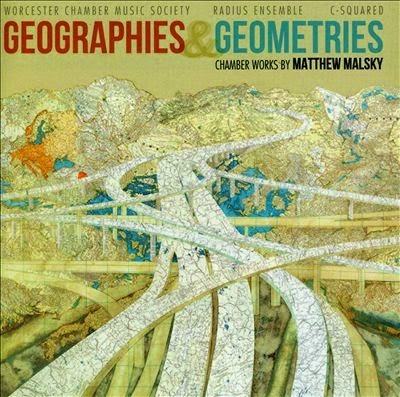 Composer Matthew Malsky gives us five of his recent chamber works on Geographies and Geometries (Ravello 7891). These have a genuine presence, notable rhythmic vitality and a modernist abstract sequencing of musical syntax that has excellent flow. All were written between 1999 and 2013. The variety of instrumental configurations makes for dramatic contrasts and highly listenable fare. The part writing unwinds with perfect sense; each work holds its own with a tightly compressed economy of means, less Webernian pointillism than through simultaneity and parallel expression, jagged togetherness if you will. Each piece is a microcosm of Malskian form in motion. From the opening "Archipelago of Regrets" (2012) for piano trio, to the stark but dense "-42.489 108.756 (Elegy)" for two violas (2011) and "Escaping the Delta" (2005) for flute and cello, a terse expressionism prevails. "Same River Twice" (2008/2013) for wind quintet and "Subtending the Right Angle" (1999/2013) for eight-instrument chamber ensemble conclude the program with larger forces and consequently a more projecting sound imprint. All the pieces work together to give us a substantial impression. The performances are dedicated, expressive and precise. They convey very well the distinctive contemporary modernism that is Matthew Malsky. Very much recommended for the enthusiast of high modernism today.